Is Council about to sell us out to cover for an impending financial crisis? We seem to have a Borough Council that relishes controversy — or is perhaps clueless about how they cause it. The latest tempest to thunder into our fair borough comes on the back of a chihuahua, that despite our laws against it, sports a drive-through window. My experience has taken me down dozens and dozens of main streets across this country. I’ve sat down and spoken with many from those communities and discussed the challenges that they’ve faced. Towns go into decline and stay there because of gutless or ignorant leadership eager to make any deal, no matter how Faustian. When I lived in Worcester, Massachusetts, the city had just completed a magnificent $60 million restoration of its Union Station. Eager to spark more development around it, the city almost offered up a lot across the square to Days Inn for one dollar! This signaled to the business community and to the community at large how little City Hall actually valued the city it governed. Jenkintown today finds itself at a similar crossroads. Old York Road, which traditionally served as our borough’s commercial heart and soul, has become blighted thanks both to PennDOT’s intransigence and the Borough’s inability to challenge it. We’ve run out of band-aids. I’ve lived here now for 15 years, and I’ve long heard all the heartfelt and colorful stories about how vibrant Jenkintown used to be. Like many traditional towns that could not adapt to the automobile age, it lost its way. It has since applied many band-aid fixes with mixed results at best. People like to point to our Town Square and all the new restaurants, but the restaurants are here because of our demographics and improving economy, not because of any Borough policy. The Town Square, though not without its charms, is really a poor excuse for a public space. Frankly, it’s a back-alley consolation prize given to Jenkintown by the county and really provides little to no tangible benefit to the community or the businesses around it, as evidenced by how our school taxes keep going up to compensate for the declining assessments. Doylestown, Hatboro, Manayunk, Chestnut Hill, Media, and West Chester have no such town square, and yet you would never mistake their economy with Jenkintown’s. What they do have are pedestrian-friendly thoroughfares — streets that they can actually close off when necessary and have a parade. Thanks to Jenkintown’s failure to convey to PennDOT or our governor that Route 611 is killing this town, we must funnel our festivals and parades onto side streets. In 1974, Jenkintown staged its centennial parade on Old York Road. No standards. Lax enforcement. And soon, no plan. So, yes, let’s bring a Taco Bell here and grant them a variance for their drive-through window. Then we can finally state the obvious and just declare that we’ve given up. We have no standards, and we need the cash. Sorry for the time you wasted helping us develop the Jenkintown 2035 plan. The Borough needs the money to pay for a parking lot that doesn’t pay for itself, for leaves they have to pick up from private property, for a theater and library and other community programs that are not fully supported by the residents who use them, for the maintenance of six police vehicles, and for a pocket park that looks more and more like a holding yard for borough trucks and less like a bird sanctuary with every month. Why should the Borough care about its own building codes and zoning? It has for years ignored ADA laws by willfully allowing cars to park on Walnut Street sidewalks, by failing to cite crumbling properties for health code violations, by ignoring pedestrian safety on disintegrating slate and brick sidewalks, and by gathering revenue from illegal stop signs placed throughout the borough. When you remember that Council granted George Locke a 23% pay raise without a performance review, it recalls George W. Bush commending his FEMA director after Katrina destroyed New Orleans. And that there strikes to the heart of exactly the problem with this proposal. Old York Road makes it impossible to develop foot-traffic and the types of businesses that would cater to it. Instead, we get more sprawl, with Taco Bell planting that flag. Before long, we will become another traffic-choked Willow Grove instead of another New Hope, or any town with a business district we can point to with pride. We can and should do better, but we won’t if we continue to be led by the same tone-deaf Council and the machine that puts it there. “Jenkintown is not for everyone.” That’s just not nice. We merely contend that since Jenkintown presents itself as a walkable community, perhaps its budget should reflect that as a priority. Maybe the community should get involved in getting this done for the benefit of all of us. Instead, the borough doles out millions to make it easier to drive and park in town. Except for the street corners where the Americans for Disabilities Act requires the Borough to install ramps, our town doesn’t spend a dime on its sidewalks. Instead, it tells us to do it, to find our own contractor, and pay whatever they ask (which is more than what PennDOT pays). Or else. We thus pay top dollar, and we get bottom results. Is a beautiful streetscape worth $70/year to you? In the past two weeks, I’ve heard several mentions of the Ithaca plan. In short, the city assesses a fee of $70 per year for most residents, less than half of what we currently pay for trash pickup, to fund a municipal program that maintains and fixes the city’s sidewalks. Indeed, we sent out letters with invitations to discuss this further to our Borough councilors yet again, and three weeks later, no response. We have three councilors representing our ward, and none of them seem to have the time to even send an email in response. Why can’t we at least have a discussion about this? Why shouldn’t people sit down and figure out a better way? We missed a few examples on Greenwood that show Jenkintown needs a more pedestrian-first policy. And the point of this is? Yes, as we have already established, the Borough gives slate curbs a pass, but apparently the original developers of this street lined the entire road with slate. We still have a few quaint remnants of that construction, but a wholesale approach would have removed this once and for all, allowing for unified curbs designed to last at least a generation or more. This just looks sloppy. Just six feet away, weeds have taken up residence in the cracks in that slate. More Jenkintown sloppiness. We deserve better. It didn’t take long for that new sidewalk block to crack, and the patch has already crumbled away. Water will seep in, turn to ice, and destroy that block in short order. If the Borough itself contracted to do the entire street at the same time it paved it, everything you see here would look nice and clean, and last much, much longer. 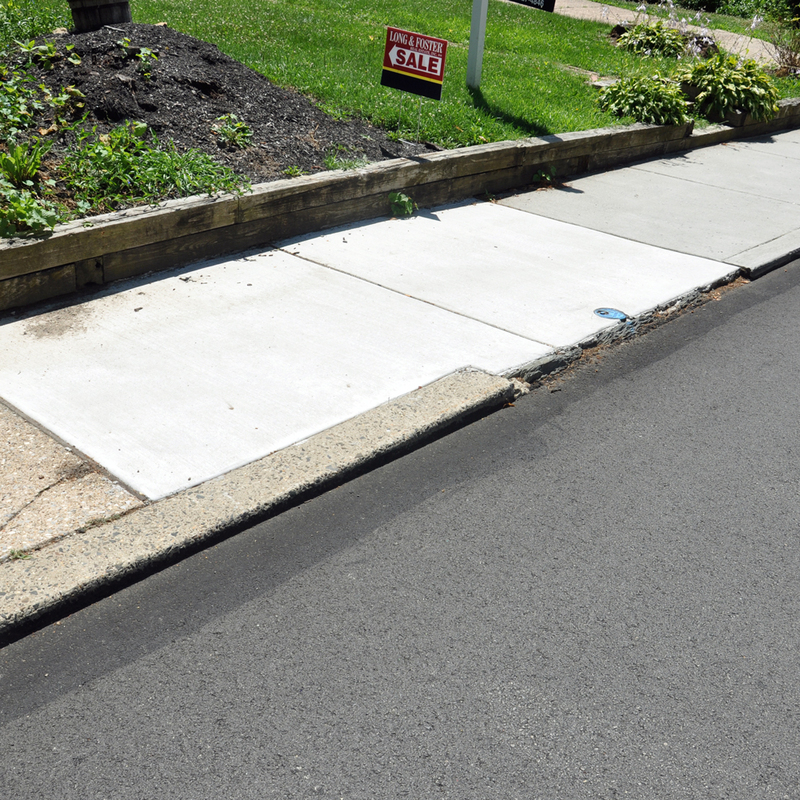 Another shoddy, apathetic example of Jenkintown borough’s inspection process. 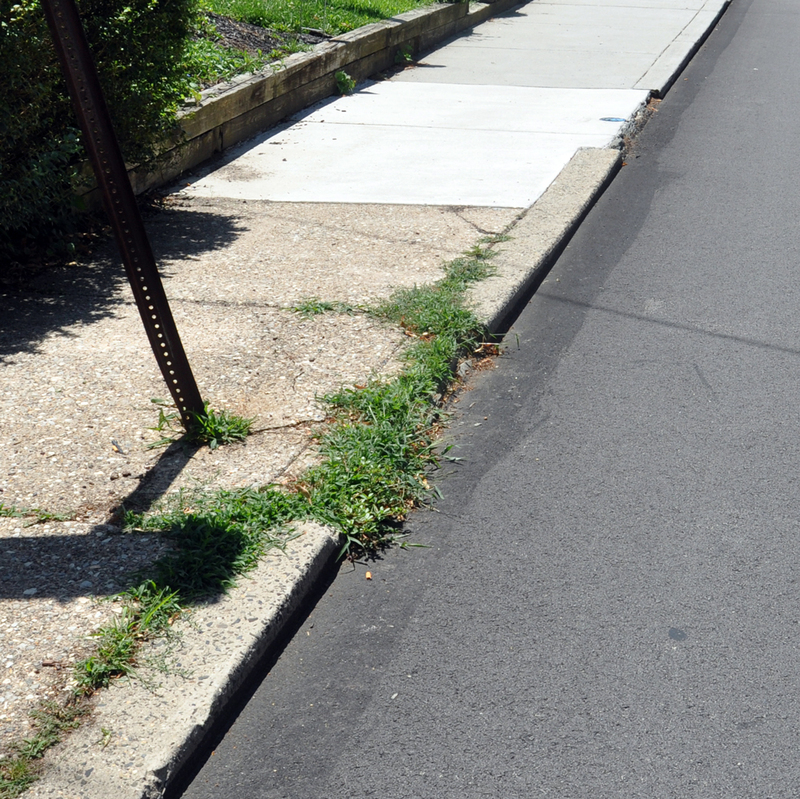 Who cares if the sidewalks look like a stretch in North Philadelphia? The street is nice and smooth. Don’t blame the abutting property owner: They only need do what the Borough requires. 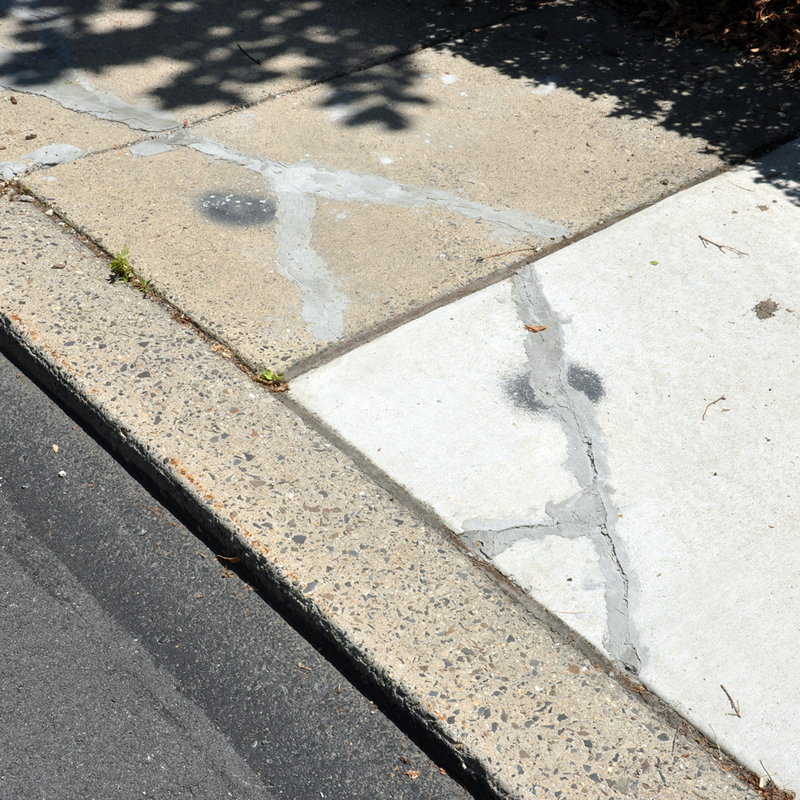 According to George Locke, Jenkintown residents pay double what it would cost the borough to repair our sidewalks and curbs on a wholesale basis. Despite the hardship to our family, we have applied for our permit to repair our sidewalk. The borough marked off four blocks, but we will do six in order to have a more uniform look to our walkway. That leaves three blocks and our driveway apron for the next resident who decides to live in our bucolic community to fix. We could not have done this without the generous cooperation of our contractor. In our discussions with this contractor, we learned about an elderly couple in their 90s on Rodman facing an $11,000 bill thanks to Jenkintown’s arbitrary and capricious pedestrian infrastructure policy. I don’t know about you, but if I live that long and keep my wits, I’d tell the borough what they could do with their sidewalks. For those who don’t live here, you might be wondering why more people don’t speak up about this issue. I can report that there is no shortage of outrage, and that Borough Council President Deborra Sines-Pancoe and Vice-President Rick Bunker lie through their teeth when they claim that no one has complained about this process. To a person, everyone I spoke with directly finds this system outrageous. 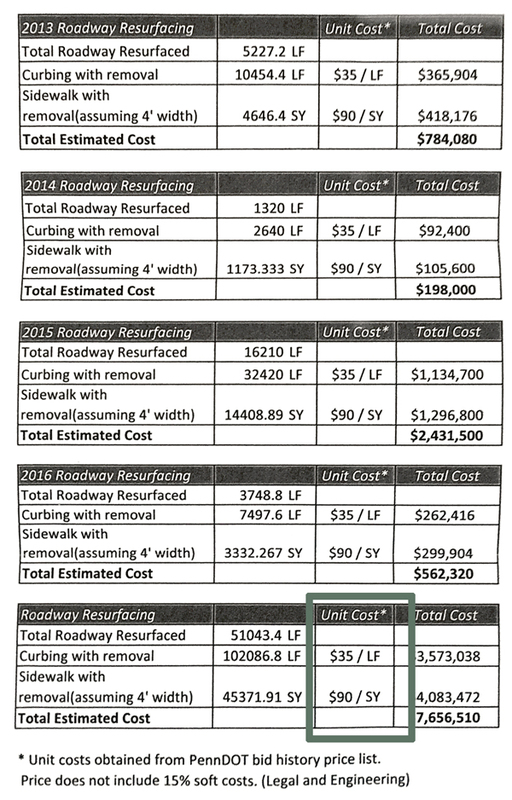 Numbers provided by the borough to show their cost of sidewalk and curb repair. Click to enlarge. 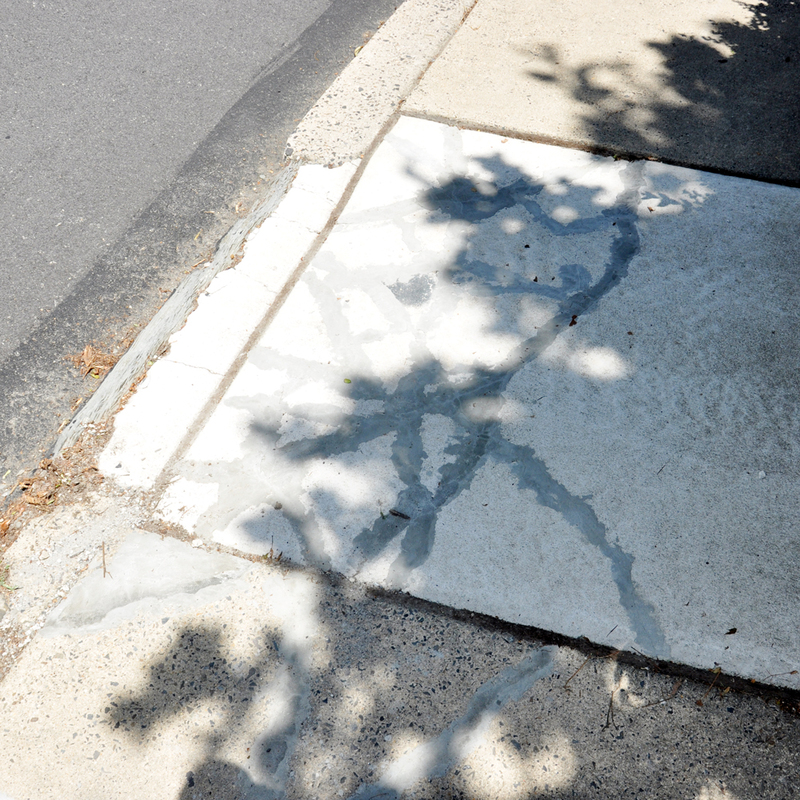 Which brings us back to Borough Manager George Locke’s estimate for repairing all of Jenkintown’s sidewalks and curbs. Last September, in response to our published research on the topic, Mr. Locke told Council that it would cost the borough $7,656,510 to do most of the borough-owned streets. He based his estimate on PennDOT’s “bid history list”. Mr. Lock neglected to remind Council that any sensible maintenance program would spread the work out over 30 to 40 years. The sidewalk blocks marked for repair in front of our house were poured in 1938, almost 80 years ago. We had one contractor estimate $3800 to rebuild 30 linear feet of curb and 64 square yards of sidewalk. Using PennDOT’s “going rate”, the borough would pay $1690, or nearly half our cost for the same job. See how much your project would cost the borough by using our new calculator at right. Compare that number with what you have to pay. The debt service on the parking lot alone has averaged about $100,000. After enforcement, maintenance, and debt service, the Borough’s parking program actually loses money. The borough also spends over $1000 per officer on uniforms for its 13 officers. We have five police vehicles, which is more per capita than New York City. The Borough budgets $40,000 to purchase new police vehicles about every three years, up from $30,000. At this rate by 2031, the borough will have spent well over $200,000 for five SUV police specials, not including maintenance. In 2014, the Borough spent 1,000 on computer software and increased it to $22,750 the following year. For the past four years, the Borough has given the Hiway Theater $26,363. I love the Hiway, but I don’t think local government should be in the entertainment business. In 2015, the Borough gave $5,000 to the Jenkintown Community Alliance. In 2015, Borough Manager George Locke received a 5.7% raise from $85,000 to $90,000. Last year, the rate of inflation was well under 2%. This doesn’t even touch upon the cost and the wisdom of the Borough’s current pavement program and its current scope. Did they need to pave so much so fast? Highly debatable. If you accept as I do that much of these funds are discretionary (i.e. better spent elsewhere), then you have a total of about $220,000 per year to put into a sensible 40-year sidewalk maintenance program without raising taxes a dime. Granted, the Borough has already committed much of this money, but without public pressure, they will continue to allow this folly to continue, and you and I will continue to be played for chumps, shelling out thousands of dollars more than we should every year and getting a garbage streetscape.